It seems as if the Chandigarh administration adopts double standards while enforcing the code of conduct for mayor elections of the Municipal Corporation. Interestingly the foundation stone of the night food street, which was inaugurated today by Pawan Kumar Bansal, minister of state for finance and parliamentary affairs, amid fanfare, was not allowed to be laid by the then mayor last year due to the objection by the presiding officer of the municipal elections. MC commissioner Roshan Sunkaria stated that the inauguration of the projects were not covered the clause of the code. Whereas ex-mayor Harjinder Kaur revealed that last year when a list of projects, which she wanted to inaugurate, was sent to the presiding officer, R K Rao, he objected to the inauguration on the plea that as the notification of the mayor’s election had already been issued, so permission for inauguration could not be granted. She stated that specifically for the night food street project, Rao informed her that the area councillor, Anu Chatrath, was objecting to its stone laying ceremony as the code of conduct had come into force. She now objected that why double standards were being followed by the authorities in granting permission for inauguration of the night food street in her area in the similar position now. She added that even other projects which included laundry mart and green belt in Sector 47 were not inaugurated by her after notification, as it was the violation of the code of conduct. Arun Sood, secretary, BJP, said it was strange that last year the foundation of the food street was not allowed due to it being against the code of conduct. How it had been allowed now when the same clause was in force. He said Congress councillor Anu Chatrath last year objected to it due to enforcement of the code of conduct of mayor elections, but today she herself participated in the inaugural function of the food street. He said they were going to present a memorandum to the administrator, adviser and deputy commissioner, who are also presiding officers of the election. While briefing about the street, mayor Pardeep Chhabra said there was eight food kiosks. 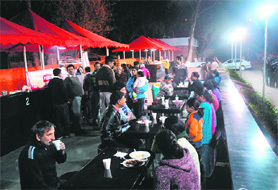 The night food street would serve traditional regional food along with Indian, continental and south Indian at Sector 14 outside the gate of Punjab University and the PGI. Two young lives of a Phase 11-based family here were snuffed out and three other members had a miraculous escape in a tragic road accident near the rotary of Phase 2 and 4 here this evening. The victims, Simran (4) and her younger sister Ishpreet (3), died on the spot after being mowed down by a speeding Maruti Zen car (CH 03 V 3054) driven by a head constable Parminder Singh of the Mohali traffic police. While the two sisters died on the spot, their one-and-a-half-year-old brother Gurkirat Singh and the parents, Dalbir and Swaran, escaped. Reports said that some other passersby were also injured due to the dangerously driven car. Soon after the accident, the victims were referred to the PGI from Cheema Hospital, Phase 4, here. Both girls were declared brought dead at the PGI. It being a week-end, Simran, an LKG student of Sant Isher School, Phase 7, and Ishpreet, had gone with their parents to Amartex in Industrial Area for some purchases for a marriage in the family. They were returning from Amartex when the speeding car crushed them. The police has registered a case under Section 304 A of the IPC against Parminder Singh, who is deputed as traffic munshi in SSP office, Mohali. Unconfirmed reports disclosed that the driver was in an inebriated state, a fact contradicted by the police. In a shocking incident, four accomplices killed jail superintendent Raghbir Singh (40) at 3 am today at Rajendra Hospital. The jail inmate Ravinder Singh of Bhaggo Majra village, Mohali, was admitted to Rajendra Hospital yesterday. Ravinder was arrested on November 25 for planning a robbery. The case was registered at the Zirakpur police station under Sections 399, 402 and 489 B of the IPC. He was admitted in Ward no. 8 of Rajendra Hospital due to leg injuries. Raghbir Singh, along with constables Bhupinder Singh and Rajvir Singh, was on duty at the hospital. While Raghbir was on duty, three of Ravinder’s accomplices reached the hospital and took him out of the ward. When Raghbir got to know about it, he tried to stop them but was manhandled. They made Ravinder sit in a Scorpio and tried to run away. The cop, in order to stop them, stood in front of the vehicle but they did not stop it and hit him. He died on the spot and the assaulters managed to flee. A case under Sections 302, 223 and 34 of the IPC has been registered against them at the Civil Lines police station. DSP Kesar Singh is investigating the case. Raids were conducted today but all of them are yet to be arrested. Jail superintendent Jiwan Garg said investigations were on and soon all of them would be arrested. Raghbir Singh was a resident of Kamalput village in Samana. He is survived by three daughters and a son. He was cremated at his native village. The entire village was shattered with the news of his death. The children yet could not believe the tragedy that has struck their lives. In a case of negligence in construction of a high-rise building, one labourer died and two were seriously injured when a portion of a beam fell on them while they were fitting aluminium plates on a side wall of a building in Industrial Area, Phase 8, here this evening. Scaffolding supporting the structure also collapsed under the weight of the beam. While a labourer Shankar Kumar died on the spot, the other two, Panna Lal and Nissar, were struggling for their life at the PGI emergency, Chandigarh. Apart from the concrete beam, the collapsing 70 feet-long scaffolding brought down a low transmission line of the Punjab State Electricity Board. A major tragedy was averted as the building stands along the road connecting the Industrial Area, Phase 8, with the busy Balongi-Mohali bus stand road. All construction material of the fallen structure littered on the road. A number of labourers were working under-construction building (plot no. 127). A person, who took the injured to the PGI, said Panna Lal and Nissar were profusely bleeding when they were admitted to the PGI. They had suffered injuries as they were sitting on the scaffolding while fitting the aluminium frames. The SP (City), Varinderpal Singh, said a case of negligence had been registered against the company, Satguru Infotech. The police has taken samples of the beam. A close scrutiny of the collapsed beam revealed that the composition of the material was very poor. A labourer revealed that a beam at the rooftop had been laid about a month ago and the building was being given final touches from outside. The PSEB has also lodged a complaint with the police as the collapse has damaged their electricity line. Though no official of the company was available at the site, JS Oberoi, the owner of the building who was present on the spot, said he had just come to check the situation. The building was being built for a call centre. Unconfirmed report revealed that the building was owned by a Punjab bureaucrat. Last year, the building was in the news when road on both sides of the plot were widened and special parking was developed in a green belt in front of the building. A CBI Special Court of Jagdeep Jain today sentenced Dr Asha Kiran, former doctor of GMSH, Sector 16, to rigorous imprisonment of one-year for demanding bribe to issue false medical certificate. According to public prosecutor Pawan Kumar Dogra, Dr Asha Kiran used to issue false medical certificates after accepting the bribe. This practice came to the notice of a litigant when she issued a similar medical certificate to Joginder Kaur, an accused in a murder case, in 2001. The bail plea of Joginder was declined in the district courts. Thereafter, she sought the bail in the High Court where she produced the medical certificate issued by Dr Asha Kiran which claimed that Joginder was unwell. Gurbax Singh from the prosecution side in the murder case against Joginder became suspicious and submitted an affidavit in the High Court stating that the medical certificate was false. Gurbax Singh then approached Dr Asha to issue a false medical certificate to another person as he had to file a petition seeking bail on August 14, 2001. Dr Asha agreed to do so and demanded Rs 20,000 but after negotiation, she agreed for Rs 6,000. The doctor told Gurbax to ask the person on whose name the medical certificate was to be issued. On August 15, 2001, Shavinder Singh, along with Gurbax Singh, came to the hospital and was admitted. The complainant gave Rs 2,000 to the doctor and the balance amount was to be paid on December 16, 2001. Gurbax Singh complained to the CBI and a trap was laid on August 16, 2001. When the complainant went to deliver the money Dr Kiran requested her husband to collect the bribe amount. A case was registered by the CBI against Dr Asha Kiran and her husband, who died during the trial. The two were booked under Sections 7, 13 (2) of the Prevention of Corruption Act, 1988. Additional district and sessions judge, Raj Rahul Garg, today sentenced Tittu of Shahpur Colony, Ravi of Dadu Majra village and Sandeep of Maloya village to life imprisonment for murdering Mustkeen Singh, Inspector with Punjab’s food and civil supplies department. According to prosecution, the food inspector was found murdered beside his motorcycle near his Markfed office in Sector 35 around midnight of August 4. The police solved the case after one and a half month of the crime following the arrest of accused from Maloya village on September 23 in 2005. The telephone call details helped the police in cracking the blind murder case. Mustkeen Singh of Khanna was coming from Mohali on his motorcycle. He was “dead drunk” and could not ride. When the accused noticed Mustkeen staggering and struggling to push the bike, Tittu offered help. He then rode the motorcycle with Mustkeen riding pillion. The Food Inspector was taken to a secluded place near Markfed building as the other two followed them. Tittu stopped the bike behind a parked bus and they tried to rob the victim, as they were about to remove the gold ring, Mustkeen reportedly regained his senses and objected. Apprehending identification by the victim, they smashed his head with a concrete slab and escaped from the spot. Thereafter, they dined out in a dhaba in Sector 22. While illegal mining in the Ghaggar of the town remains a concern for the local administration and environmentalists, the hutments set up by migrant labourers along the Ghaggar river has posed a grave danger to the health of locals. While a death was reported due to cholera in the month of July from the region the health authorities, were alarmed when a total of 26 cases of deadly falciparum malaria were detected during a survey of the area recently. In fact out of 29 cases of falciparum malaria reported from all over the district, 26 were reported from this small stretch of ten kilometres spanning between Burj Kotian and Diwan wala village. The region commonly known as crusher zone on Jalla Road, on the bank of river Ghaggar, provides livelihood to thousands for decades, including labourers, vegetable vendors, and dhaba wallas. Majority of workers employed at the crushers, washing plants and for quarrying at the riverbed reach from different parts of country, including Bihar, Rajasthan and Uttar Pradesh. While the labourers living along the river and nearby forest areas are prone to vector borne diseases, it was also apprehended that falciparum malaria in the region entered the region with the migrants from eastern Uttar Pradesh. There were more than 5,000 labourers and including their families it was more than 20 thousand people who were settled along the riverbed spanning over five kilometers. Dr Anil Ailawadhi, deputy civil surgeon, (malaria) said while four types of the plasmodium parasite can infect humans, the most serious forms of the disease are caused by plasmodium falciparum and plasmodium vivax, but other related species plasmodium ovale and plasmodium malaria can also affect humans, he said. However, the severe malaria is almost exclusively caused by plasmodium falciparum infection and usually arises 6-14 days after infection, said Dr Ailawadhi. In fact it results in several health complications, including coma and death if untreated, he added. While the cases of plasmodium falciparum kept on reporting it was decided to conduct the survey before it could spread in the nearby towns of Pinjore and Panchkula, said Dr Ailawadhi. The teams under Dr Surinder Nain, CHC, Kalka and Dr Anup Jain, PHC, Pinjore were constituted for the purpose and patients were administered and given medicines, he said. The medicos were however shocked to find that three members from two of the families living in the area were infected with the deadly disease. The local chapter of Merchant Navy Officers Association (MNOA) today came forward in support of two Indian seafarers who have been detained by South Korean authorities since December last year after a floating crane collided with their anchored tanker. Demanding immediate release of Captain Jasprit Chawla and Chief Officer Syam Chetan, MNOA president Capt Bhagat Singh said despite being proven innocent by a trial court, the matter had gone into appeal and the duo were being refrained from joining their families in India. “The international shipping fraternity is disturbed at this development and have raised concerns with the Korean authorities that justice for seafarers should be done and they must be released immediately as it was an example of criminalisation of seafarers,” Capt Bhagat said. Capt Jasprit Chawla’s vessel, MT Hebei Spirit, was at the anchor near the port of Daesan about 90 miles South West of Seoul, when a tug-towed crane barge belonging to Samsung Corporation collided with it on December 7, 2007. The barge was floating free after the cable linking it to the tug had snapped in the rough seas. The collision punctured three of the five tanks aboard the Hebie Spirit, resulting in the leakage of about 10,800 tonnes of oil into the sea. The appeal decision is scheduled to be handed down on December 10. Captain of the recently freed hijacked vessel Stolt Valour, Prabhat Goyal and his wife Seema were also present at the press conference. “I can well imagine the trauma that their families are going through. Capt Chawla's wife, Gurpreet, has two small children to take care of and is under depression. I urge the authorities to ensure total transparency in the trial and repatriate the two seafarers.” Seema said. Taking about piracy in the western Arabian Sea, Capt Goyal said that only a multinational maritime force, under the aegis of the United Nations, was the answer to the growing threat. “To bring the pirate groups under control, a stable government is required in Somalia which is not going to happen anytime soon,” he said. “The answer to sanitise the area is therefore through an international force acting as UN peacekeepers,” he added. He said warship of coalition nations, operating in the area, tend not to respond to distress calls from merchant mariners unless a national from their respective country happened to be on-board. This was the first question raised by a warship answering a distress call, he said. Dr Ramesh Kumar Sen, additional professor and head of orthopaedic department, Unit II of PGI, has been awarded the golden jubilee commemoration award for his scientific contribution in stem cell research in the disease of Avascular Necrosis (AVN) of hip joints. The award was conferred upon him by the Indian Orthopaedic Association (IOA) in its 53rd annual conference in Bangalore on Friday. This is the highest research award of the association which has a membership of 7,500 orthopaedic surgeons of India and abroad. The award included a golden plaque and cash. The research on the clinical use of stem cells has been done with the help of blood transfusion department in collaboration with association of Dynamic Osteosynthesis, Hong Kong and association of Orthopaedic Research, France. This usage of stem cells in the treatment results in regeneration of blood supply to the femur head, thus saving the patient from undergoing hip replacement surgery. The association has also decided to start a ‘Research Foundation of IOA’ under the chairmanship of Dr Sen to promote research in various orthopaedic conditions affecting the population in our country. The foundation will fund the selected research projects by Indian orthopaedic surgeons for whom the financial support has not been available earlier. Dr Sen, who is a PhD in the field of orthopaedic surgery, has extensive experience in the filed, especially in joint replacement surgery. He is also the founder of association of pelvi-acetabular surgeons in India. He has been an examiner for postgraduation in orthopaedics in many international and Indian universities. He has to his credit 73 publications in various journals of repute, including 23 international papers and has five chapters in various books on orthopaedic surgery. It seems the Chandigarh Municipal Corporation (MC) authorities did not find time the whole year either to study or table the report of the high-powered committee which was constituted in April last year to prepare details of the problems between officials and councillors in taking up development works. The house had constituted the committee, which included representatives of all parties, two nominated councillors and one official each from all departments of the corporation. The committee was to study what hampered coordination between councillors and officials and streamlining the process of development in proper implementation of the projects passed by the house. The committee took up the issues relating to the gap between the officials and councillors and suggested measures to lessen the delay in work. It also prepared the status report of all the projects. Sources revealed that four meetings were held last year and the committee prepared a report. Interestingly, till date no report has been tabled in the house and none of the councillors questioned regarding the whereabouts of the committee report. Strangely, in every house meeting the councillors took up the issue of red tape of the MC functionaries and implementation of the development work passed by the house. Jatinder Bhatia, BSP councillor, expressed anger at the need of framing high power committees. He said the house is only busy in constituting committees on every issue rather than solving problems. Akali councillor and former mayor, Harjinder Kaur, stated that councillors were busy in overlapping their own decisions and have no concern about their past orders. In an effort to provide impetus to the education of the backward classes, the health ministry has sanctioned Rs 250 crore to PGIMER for setting up the requisite infrastructure for the implementation of 27 per cent OBC reservation. The OBC quota will come into effect from the next academic session, affecting all students getting admission to postgraduate courses, nursing and paramedical courses. The PGI, meanwhile, has started preparations for implementing the reservation policy and creating the necessary infrastructure. “We will have the additional 250-bed block adjoining Nehru hospital for training of students, 250 rooms for hostel and additional quarters for taking an additional 216 students during the coming sessions,” said deputy director, administration, PGI, AK Gupta. He said this would be implemented in phases, as we don’t have the adequate infrastructure. According to information, the institute has 396 reserved seats in various departments at present, which include the 15 per cent quota for SC and 7.5 per cent for ST students. After implementation, the seats will be increased by 54 per cent. As a result, the seats will be increased from 396 to 610. The decision was taken at governing body meeting of the PGI. Even after the onset of winters residents of the town could not get the respite from frequent power cuts. While these power cuts have taken a toll on the business, the water supply too remains irregular in some parts of the town. In fact there were power cuts from 9 am to 6 pm for the past few days in Sector 21, 12, 3 and Sector 4. Now the authorities have already announced a cut during same hours in Old Panchkula. “The condition of power supply, however, can be well imagined during next two months when the demand of power increases with the usage of heaters and heat convectors at their homes,” said Raj Kumar, a resident of Sector 21. Uttar Haryana Bijli Vitran Nigam Ltd (UHBVNL) has been making routine in imposing heavy unscheduled power cut daily consecutively for the past three days, which is intolerable, said S.K. Nayyar, president of Citizen Welfare Association. The next 2-3 months are crucial for students and if such power cuts were imposed by the UHBVNL daily for such a long periods the students would have o bear the brunt. Similarly, the business carried out through electricity appliances and gadgets’ may found at the verge of closing, he said. The Haryana Vidyut Prasaran Nigam (HVPN) spokesman said the towers of power supply lines were being shifted to new locations due to widening of the National Highways Road (NH-22) on Panchkula-Zirakpur Highway and these power cuts may continue for a period of about 2-3 months. Ex-servicemen have welcomed the decision allowing personnel below officer rank (PBOR) to purchase cars through CSD canteens from next month. At present only officers are entitled to this privilege. However, the PBOR can purchase a car through the CSD only once in five/seven years and it cannot be transferred to a third party within two years of its purchase. Changes in the socio-economic status of the retired PBORs, as well as personal or professional requirements and other social obligations the ex-servicemen purchasing cars from the civilian market at higher prices that available in the canteens. Nominated councillors M. P. S. Chawla, and P. K. Mukherjee today challaned the contractor of Sector 17 paid parking of Bank Square for violating terms and conditions fixed by the corporation. M. P. S. Chawla said while surprise checking it was found that the contractor was violating the terms and conditions framed by the corporation, which included less manpower, excess vehicles, and haphazardly parking. He said the challan was issued to the contractor on the spot. Confusion prevailed in a gynaecology ward of GMSH-16 here today following the alleged negligence of some doctor that led to the removal of stitches of a wrong patient. According to sources, the doctor on duty wrongly removed the stitches of a patient, Razia, which was scheduled for the removal two days later. The sources in the GH-16 confirmed that it was only due to the similar ailment of two patients and they were sharing the adjacent beds. A doctor said both patients were undergoing the same treatment that resulted in confusion for the doctor. “Both patients are still under the treatment,” said Dr SK Bhandari, deputy medical superintendent, GH-16. He further clarified that it was a routine case and nothing of sort happened. Spiritual fervour pervaded the Sri Sathya Sai complex here as the Bollywood playback and ghazal singer, Manhar Udhas, rendered his choicest devotional compositions in laudation of Shri Sai Baba on the Sai temple premises here today. The devotional musical soiree marked the 13th annual celebration of the installation of the idol of Sai Baba. Manhar commenced with shlokas and Gayatri mantra. He submerged the audience in devotion as he presented “Jis Sai ne dard diya hai”, “Karmo ka phal, jab jab bolo” and many more. Manhar, who had over dozen hit films, ten ghazals and scores of Sai bhajan albums to his credit, established rapport with the audience. He delineated the philosophy laced in the teachings of Sai Baba as enshrined in all the lyrics penned by K. Razdan. The accomplished accompanying musicians, especially Musharaff Khan and Suresh Taale, indulged in crisp jugalabndis much to the pleasure of the audience, who clapped in unison as Manhar doled out more and more bhajans on their request. The Department of Internal Medicine, PGIMER, in collaboration with Asia Pacific Association of Medical Toxicology (APAMT) and South Asian Clinical Toxicology Research Collaboration (SACTREC), Sri Lanka, is organising the 7th annual congress of APAMT from December 8. Around 150 delegates from across the world would be meeting to discuss problems of the burden of poisoning in the world and its implications. Prof Andrew Dawson, president, APAMT, and Prof Surjit Singh, organising secretary, have tried to make the scientific programme interesting and relevant to the current scenario. Addressing mediapersons, Dr Surjit said pesticides had played a major role in the agricultural revolution across the world but their easy availability and potentially lethal nature had resulted in their misuse as agents of self-harm. The Forum for Popularisation of Science and Culture conferred lifetime achievement award upon B. S. Behl for his contribution in the field of science and technology at a function held at Taj, Sector 17, here today. Some other scientists, like Prof J. N. Nanda, Prof N. K. Ganguly and Er Jagman Singh, were also awarded the Eminent Scientist Award. Giving these awards, the Governor of Haryana, Dr A. R. Kidwai, said, “There have been tremendous achievements in science, and the nation is self-sufficient to excel in this field. This is only because of the advancements in the construction of Bhakra and Beas projects,” he said. Prof R. C. Sobti, vice-chancellor, Panjab University, was also present. Vice-Chancellor R. C. Sobti constituted a high power committee to ensure efficient electoral mechanism of senate elections at the first meeting of the newly constituted Panjab University senate today. The move followed highlighting of the irregularities of the existing voter lists, especially in graduate constituency and “faulty” evaluation of nomination papers by fellows. He also promised the standardisation of enquiry mechanism and reports of various committees as one of the fellows highlighted the issue of extension of affiliation to various colleges, like Arts College, Sector 10, due to discrepancy in reports of committees, visiting them over the period of time. Taking the issue further and discussing the problems like under-payment to teachers and abrupt fee structures by various colleges, the house resolved to cancel the affiliation of the college that fails to abide by university’s calendar in totality. A fine of Rs 25,000 was put on SD College for its failure to take mandatory prior approval of the university before starting two new honours courses. Among other declarations, VC also announced a fee of Rs 5,000 for the first extension and 10,000 for second in MPhil courses, citing easy availability of these extensions being used as tool to overstay in hostels by many students. He also promised declaration of PhD results within 120 days and revamp the scholarship programmes, which found few takers due to minimal amounts offered. Among the fresh appointments and extensions, members also gave their approval to re-employment scheme for retired PU teachers. The syndicate, in its previous meetings, has already approved of the scheme. The retired teachers would be re-employed on contractual basis for a period of one year on the last salary drawn minus PF. Also, these teachers will have to vacate their official residence by December 31. However, most of the members strongly condemned “midnight knocks” to deliver the court orders. The senate also formally approved OBC quota. Meanwhile, the elections for the deans of faculties and next syndicate would take place on December 7 and 8, respectively. All senators applauded special grant of Rs 100 crore by Prime Minister Manmohan Singh and also selection of PU for the PURSE (Promotion of University Research and Scientific Excellence) award, which included a grant of Rs 10 crore per annum for three years by the department of science and technology, Government of India, has selected our university. The PU south campus in Sector 25 seems to be far behind its lucky cousin the north campus, Sector 14, when it comes to internal security. A visit to the campus is enough to reveal the truth behind the university’s tall claims of efficient security mechanisms. It may be noted that though the south campus of the university consists of University Institute of Engineering and Technology (UIET) having largest strength of the students and the department of dental sciences but the security at the south campus remains unchecked. Though security personnel have been deployed but they are hardly found on duty. The situation gets more grave as it comes as sheer ignorance of the incident of stabbing that happened few months back, wherein some students entered the examination hall of University Institute of Legal Studies (UILS) and stabbed a student. Not only this, fights are the common scene at the university and seems that the authorities are waiting for more incidents. Though earlier, the authorities have started revamping the old system of having its own personnel to look after the security aspects, the whole experiment of deploying the private security has flopped thus a lot needs to be done. Meanwhile, even after repeated attempts Naval Kishore, dean students’ welfare (DSW), could not be contacted for his comments. St. Xavier’s Senior Secondary School organised Symposium 2008(SCIMAT) on science and maths today. Various city schools participated in competitions like science declamation, debate and quiz. Monika Sharma and Anshu Sharma of St. Xavier’s, Panchkula, stood first. While Second prize was awarded to Arshdeep Kaur and Sumit Wadhwan of Manav Mangal School. Agami Mehta and Rahul Mukherjee of Senior Secondary School bagged third prize in science declamation. In the science quiz, Sukrant of D.A.V Model School-15, was given first prize, Kanika of Bhavan Vidyalay, Panchkula and Veer Arjun of Manav Mangal School, were given second and third prize respectively. Prof R.C. Sobti, vice-chancellor, Panjab University, was the chief guest.